The hardest thing about being homeless for George Perez was acting like he wasn’t homeless. During the day, Perez would study at school, go to class or clean up in the campus gym. At night, the 39-year-old sophomore at City College of San Francisco was downtown, sleeping at BART stations to keep warm. 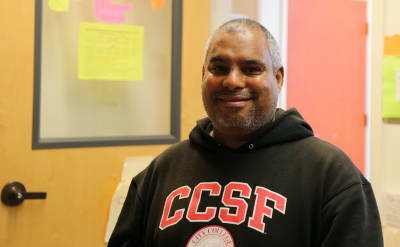 Now Perez works at the Homeless At-Risk Transitional Students Programs (HARTS) at City College of San Francisco. He helps students experiencing the kind of housing instability he knows all too well. At a recent Board of Supervisors committee meeting, Supervisor Scott Wiener asked San Francisco's colleges and universities what they are doing to provide more on-campus housing for those attending the 30 or so colleges and universities in the city -- a population estimated to be at least 80,000, according to the city's Planning Department. The Planning Department says there are about 9,000 on-campus beds available to students across campuses citywide. AnMarie Rodgers, a senior policy adviser with the department, said at the hearing that even though colleges have built more housing and have plans to build more, the city would need 28,000 more beds to house just half of those attending school here. Those beds won't appear any time soon. The process of building in the city is expensive and slow. David Seward, chief financial officer for UC Hastings College of the Law, told the hearing about another obstacle public colleges face in developing housing. "There is no state funding provided to support student housing," Seward told supervisors. "Under the Master Plan for Higher Education, all of these projects must be self-supporting." 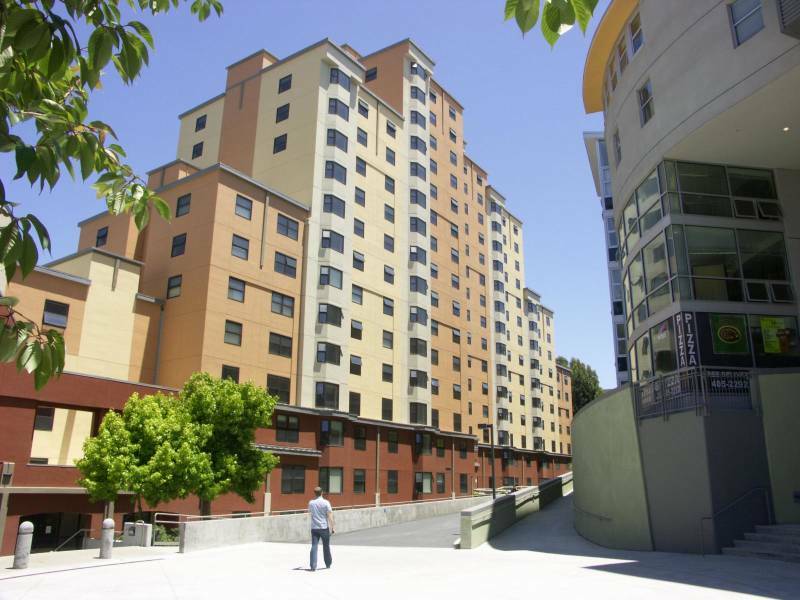 One place the shortage of student housing is particularly acute is San Francisco State University, which provides housing for about 4,000 of its nearly 30,000 students. Changing enrollment patterns at S.F. State have increased the demand for local housing among its students, said Jo Volkert, the school's interim vice president of student affairs. Last year, 50 percent of freshmen came from counties outside the Bay Area -- double the rate in 2000. Volkert notes that those students generally don't have family nearby they can live with. Erick Gaona, a junior studying environmental science at S.F. State, applied for on-campus housing last semester. Gaona was put on a waitlist. But with school starting, he felt he couldn't wait any longer and began looking for off-campus housing on Craigslist. When he found nothing within his budget, he decided to live out of his car for a month. "It definitely was a downer," said Gaona. "The thing I was worried about mostly every day was that if my car got broken into, then my 'house' basically has this huge hole in it." Gaona, who is from Los Angeles, had his entire life in his car. He said that was the only inconvenience. But Gaona often had to schedule his sleeping schedule around store hours at the Trader Joe's near campus so that he could wash up before it closed. He had a yoga mat for a mattress and couldn't cook warm meals. Finding a shared house in the Sunset District has made all the difference in his college experience, Gaona said. "I've found my grades have gone up because having that comfort and having that proximity," he said. S.F. State has announced plans to develop housing that would ease, if not end, its housing squeeze. The university currently has a public-private partnership called the Holloway Project under review. Officials say the project would add about 250 to 450 beds and could be ready to occupy by 2018. Some students who choose to attend school in San Francisco are finding ways around dealing with the housing market, by avoiding it. Half of all students attending S.F. State don’t even live in the city, according to the university’s latest transportation survey. Instead, they live in the East Bay, North Bay or Peninsula. Patrick Racela, 23, drives to S.F. State from his parents' home in Pittsburg -- about 40 miles away -- because he cannot afford to live in San Francisco. He said his commute to school lasts anywhere between an hour to an hour and a half one way. Because Racela also works and is involved in organizations on campus, he said he has to plan his life weeks and even months ahead to account for the time it'll take him to get from Pittsburg to the city for events and meetings. Racela said he sometimes still thinks about one day being able to move to the city, but hesitates when he thinks about his student debt. For now, he's putting up with the commute. "The hustle and grind really puts a strain on you as it is," he said. "Commuting can intensify that strain." The rapid rise in San Francisco housing prices is also making it hard for students to find a place to live -- even at schools training future doctors and lawyers. Clare Hansen-Shinnerl, UC San Francisco’s assistant vice chancellor of campus services, told supervisors that the medical school's students used to rely on off-campus housing but can no longer afford it. Because on-campus housing at UCSF is currently 40 percent below market rate, Shinnerl said on-campus housing has become all the more appealing. But the university has housing for only about 1,000 of its more than 6,300 students. Shinnerl said the housing shortage at the college is a particularly pressing problem because of how critical access to campus is to the medical curriculum there. UCSF is planning to build 550 housing units in the city's Dogpatch neighborhood, but Shinnerl admits that doesn’t solve much for current students. “We call the students and trainees at UCSF right now the 'sandwich generation,' because they don't have a solution for them,” said Shinnerl. At the HARTS program at City College of San Francisco, students stop in for food vouchers and subsidized Muni passes. In one corner of the office there’s a microwave on a shelf, along with free Cup Noodles. They’re paid for out of the pocket of Chris Shaeffer, the program's coordinator. HARTS can help with paying for things like books, food or transportation. When it comes to housing, it can only refer students to waitlists for shelters and single-room-occupancy hotels. That's because City College of San Francisco has no on-campus housing options, as is the case with most community colleges, which are built by design to serve residents who live close by. But Martha Hurtado, the office assistant at HARTS, said she sees how the cost of housing in the city affects the students who stop by the office every day. Shaeffer said the city is losing out on individuals who can and want to contribute to society.